I feel like I'm always saying this, but life really has been crazy around our house recently. I'm finding myself looking for as many nutritional alternatives as possible to get us more healthy in the midst of what feels like chaos! Snack type foods that aren't "junk" food is something I'm really focusing on these days. With two growing boys (they are 10 and 8 now! ), I'm noticing they are always wanting to graze on food. If chips are around - they get inhaled. So when I realized that they loved snacking on muffins I got to work on finding several easy go to recipes to have. 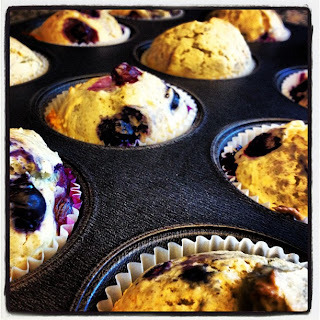 I use fresh berries, whole wheat flours and skim milks whenever possible. 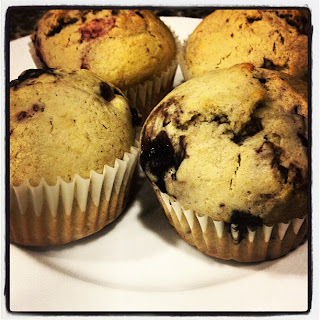 Muffins freeze very easily, so every weekend I make a batch or two of whatever berry I pick up that week and they all seem to be gone by the next weekend! And I'm totally ok with that since I know what has gone in to them. My current favorite recipe is below. I switch out the berries for whatever I have on hand (fresh strawberries work great in the recipe). Cook up a batch and let me know what you think! In a large glass measuring cup - melt the butter. Add milk, eggs, lemon juice, zest. In mixer bowl - add all the dry ingredients. Mix. Then slowly add in the wet ingredients from the glass measuring cup. Mix thoroughly. Then add in the fruit you are using. With an ice cream scoop, add to paper muffin cups in muffin tin. Bake at 375 degrees for about 25 minutes. Makes about 20 regular sized muffins. omg, these look delicious! I'm definitely going to make these this weekend. In the recipe, it calls for Lemon Juice, but does not say how much. Is it all the juice and zest from one lemon or less? Thanks for your help! I use the lemon juice AND the zest from one lemon. But I admit I have used only half a lemon and it still tastes great! I'm trying to make these muffins but the batter is extremely thick. I'm using frozen blueberries but I hate to waste them if the batter is not suppose to be thick. I double checked to make sure I had the ingredients right. Advise. Did you melt the butter and add the milk then add to the flour mixture? The batter is definitely thick and scoopable - but less thick than play doh. I did finish adding the blueberries to the batter. We just sampled them and they are delicious! Mine just did not look as pretty as yours but I'm sure that was just me. Thanks for answering so quickly. So glad it worked out! You can switch out the blueberries for all sorts of other berries. It's my favorite "base" recipe that I play with! Pirate Mickey Ears Birthday Cake! Baby Steps to Go Green - Recycled Post-It Notes! Free Coffee At Seattle's Best on Tax Day!